A complex winter storm will bring a wide range of impacts to the Finger Lakes. For ease in communicating the threats and storm conditions, I’ve broken the storm into 2 phases. The first phase of the storm goes from 5pm on Monday until 2pm on Tuesday. During this time, precipitation will overspread the Finger Lakes from southeast to northwest. Warm air will also move in from southeast to northwest, transitioning the snow to rain for most of the Finger Lakes. Phase 2 of the storm will start when the rain/snow line begins to retreat back to the east as the storm pulls away. Precipitation will break out this evening as snow A quick couple of inches will fall across the eastern Finger Lakes, but warm air will change the precipitation to ice, then rain, before the sun rises Tuesday morning. 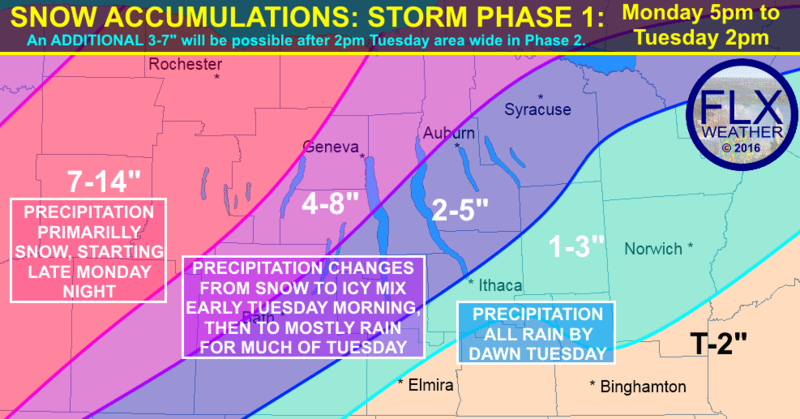 Throughout Tuesday morning, the rain/snow line will push west through much of the Finger Lakes. Thankfully, most areas will see only a trace of ice as the transition from snow to rain should be quick. Only a few patchy locations where cold air hangs out in sheltered pockets will the ice linger longer. For the purple, blue and cyan areas on the map, the snow totals listed will fall before the transition to rain. Over the western Finger Lakes, the cold air will hold enough for primarily a snow event. Generally speaking, around a foot of snow may fall by Tuesday afternoon in these areas. After the snow transitions to rain, it should remain rain into Tuesday afternoon. Heavy rainfall, with amounts in excess of an inch in some areas, could produce localized minor flooding of small streams and poor drainage areas. Thankfully, at this time, it appears that more significant or widespread flooding is unlikely. As the storm begins to pull away Tuesday afternoon and evening, the heavy snow over the western Finger Lakes will transition east. All area of the Finger Lakes will be at risk for several more inches of snow during this second phase of the storm. Generally speaking, an additional 3 to 7 inches is expected before the storm ends late Tuesday evening. For some parts of the western Finger Lakes, this could push storm totals to 18″ or more. It is important to keep in mind the different phases this storm will have, as well as the tight cut off between rain and snow that will exist. The ranges in the snow map overlap slightly because of the inherent uncertainty in dealing with transitioning precipitation types. Do not get caught up on the predicted amounts, but pay more attention to the different storm phases expected in your area. Also realize that that specific times for transition between rain and snow are not given because it will be a gradual, east to west process and each location will have the transition at different, but very specific times. It is simply not possible to pin point the exact transition time for specific locations, but the general ideas should turn out mostly true.